"This is the recipe of Korean-style seaweed soup. It's a traditional birthday dish in Korea. 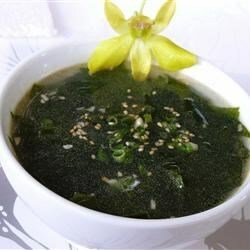 Also, every women who gives a birth eats this soup because it is believed that seaweed soup helps with breast feeding." Soak seaweed in water to cover. When soft, drain, and cut into 2 inch pieces. Heat a saucepan over medium heat; add beef, sesame oil, 1/2 tablespoon soy sauce, and a little salt, and cook for 1 minute. Stir in seaweed and remaining 1 tablespoon soy sauce; cook for 1 minute, stirring frequently. Pour in 2 cups water, and bring to a boil. Stir in garlic and remaining 4 cups water. Bring to a boil, cover, and reduce heat. Simmer for 20 minutes. Season to taste with salt. I am 1/2 Korean, 1000 miles away from my mother's cooking and craving seaweed soup! Made this recipe exactly as suggested and it was perfect. Thank you for sharing this great recipe! So delicious. I've had this soup with the sirloin substituted with clam and made it really, really good.